Zhou Xiaochuan' comments came during a news conference following a meeting of the National People’s Congress on Thursday, Xinhua reported. According to Zhou, compared to China’s massive $11.3 trillion economy, the scale of monetary policies- such as slashing interest rates or printing money, are punitive. Zhou said China’s economy, which has grown at record-breaking speed during the last two decades thanks to exports, has now entered a “new normal.” There will be some "flexibility" of the prudent monetary policy, Zhou added. China's gross domestic product expanded to 7.4 percent in 2014, the lowest level of growth in the last 25 years. In 2015, a more moderate 7.0 percent growth is expected; still the world’s fastest growing economy. 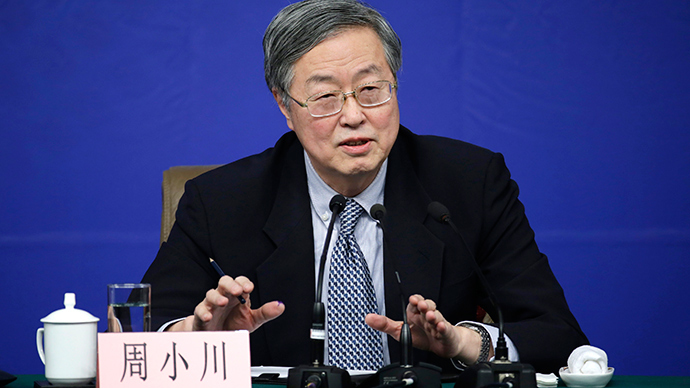 Vice Governor Yi Gang of the People’s Bank of China (PBOC) backed Xiaochuan’s statement. "The People's Bank of China (PBOC) is managing the liquidity when pursuing a prudent monetary policy,” Gang said. The central bank also has advised banks to lower deposit rates, Bloomberg News reported, citing sources. This would keep rates from increasing too rapidly and at the same time give the PBOC control.